Steve Jobs repeatedly talked about the iPad as a "third category of products" (between smartphones and computers) throughout his presentation of the new Apple tablet, iPad. He talked about netbooks, saying, "the problem is that netbooks aren't better than anything!" Essentially, Jobs argues that netbooks bring nothing new to the table. That might be true, but neither does the iPad. Essentially, the iPad is a really big iPod Touch. It measures .5 inches thick, has a 9.7 inch display and weighs in at 1.5 pounds. Like everything Apple, the user interface is slick, seamless and fluid. During the demonstration, the e-reader (dubbed iBooks, of course) looks like a step way above the Kindle - books are in color and videos can play right inside the book pages. Same goes for newspapers. That was demonstrated by viewing The New York Times - an interesting choice, as NYT announced they will start to charge for content. Coincidence? Considerable time during the presentation was spent on an some unlikely flagship apps - iWork. All of the standard features were present with document creation, spreadsheets, data import, etc. Impressively, each iWork app is priced at just $9.99. That's nice, if you want to work in the insulated world of iWork. Of course, you could always navigate over to Google Docs instead. Video, of course, is second-to-none on the iPad, as is the gaming experience. iPhone apps will run on the iPad (or at least most of them) but there will also be standalone iPad apps - a potential boon to developers, who can now get started with a SDK for the iPad. Data plans start at $14.99 for 250 MB per month or $29.99 for unlimited data, with no contracts. And, all 3G models are unlocked. Pricing. 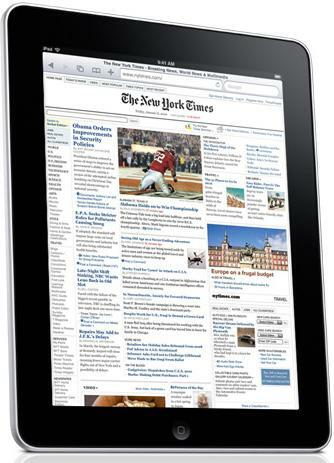 Many people are going to get really excited that the iPad is available for just $499. However, that's a version with WiFi only, and just 16GB of storage. To get 3G (and what's the point of this thing without a fast connection), you're looking at a minimum of $629. Want to treat this thing like a working computer and not just a browsing device? You'll need more storage ... 64GB for $829. A full price breakdown can be found below. The iPad is a beautiful, intuitive, convenient way to surf the Web. What's more, the iPad naturally will have some amazing apps. iPhone apps will run on the iPad (or at least, most of them) but there will also be standalone iPad apps - a potential boon to developers, who can now get started with a SDK for the iPad. But the integration (or lack thereof) of all these killer apps might also be the iPad's biggest downfall. Astoundingly, there was no mention of multitasking with apps and browsing with the iPad - one of the biggest complaints users have with the iPhone. Does this mean I can't stream music while reading the morning New York Times that I just paid for? No Flash. Just like another iPhone shortcoming, the iPad has problems with Flash. AT&T. Yep, the iPad is tied to AT&T - yet another iPhone shortcoming. It's one thing to drop a phone call or not be able to get the latest sports scores while traveling. What happens when you're trying to get some real work done and you lose your connection? The whole beautiful interface is next to useless until AT&T bulks up their 3G coverage. There's no camera. 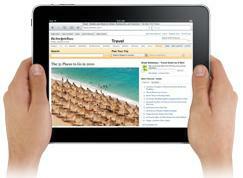 Wouldn't it be nice to iChat with your friend in Itasca about the iBook you just read on your new iPad? There's no denying that this device is cool. But "magical" as Jobs suggests? In the end, it looks like the iPad is really just a large iPod Touch - look no further than the price as your first clue. But it does have a bigger keyboard. Which is nice.